Your AirborneAngling Daddy has some new toys! 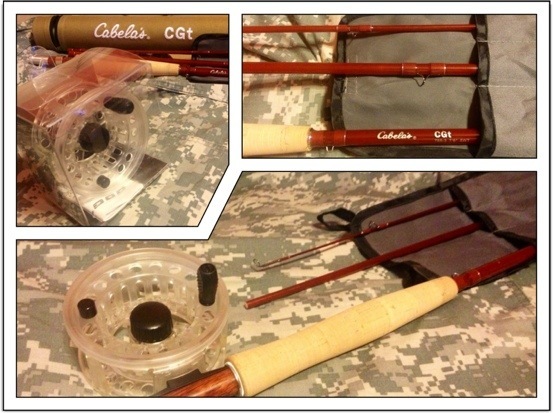 New in the kit bag is a Cabela’s CGt fiberglass 5wt rod, and the Loop Evotec CLWC-five-eight reel. A sweet little combo I like to call glass on glass. I already have the CGt in a 3wt. I like how it’s made me learn to slow down and feel my line load more. I’ve really had to earn my cast. Stepping up now to a bigger gun- I look forward to reaching out and touching some fish. The Evotec CLWC isn’t glass but a clear composite. Being the 5-8 model it’s a lot large a reel than I’m used to. Initially I searched the web for the smaller 2-6 model, but both have been incredibly hard to find. I had but all given up until I spotted this hot number on eBay. On the morrow I’ll be looking for some fly line and likely to default to some Rio Gold at my local fly shop. I’d like to see some pics of the rigs you guys are slapping the water with. Share them over on the TheAirborneAngler Facebook page!